What’s it about? This is the summer Cullen Witter’s younger brother, Gabriel, goes missing and his town becomes obsessed with an extinct woodpecker, which has suddenly reappeared. This book won the 2012 Michael L. Printz award and the 2012 William C. Morris award; both awards are well deserved. I loved this book. This is the kind of book you come back to and reread because it has left a mark on you. It was weird but beautiful tale. I thought a lot about Holden Caulfield while reading this book. Now if you didn’t like Catcher in the Rye, then don’t take this comparison to mean you won’t like Where Things Come Back. I was reminded of Holden because Cullen is dealing with a profound loss and trying to figure out everything he thought he knew. We watch as Cullen stumbles through his summer, trying to live his life as best he can, considering everything that has happened. Along with Cullen’s story we also read about Benton Sage, a young missionary in Africa. I loved how Whaley connected these two stories at the book’s climax. It speaks a lot about how the lives of people who have never met can have a great impact on one another without ever knowing it. I’m not going to say much more about this book because I really think it’s the type of book you need to experience yourself in order to fully appreciate its brilliance. 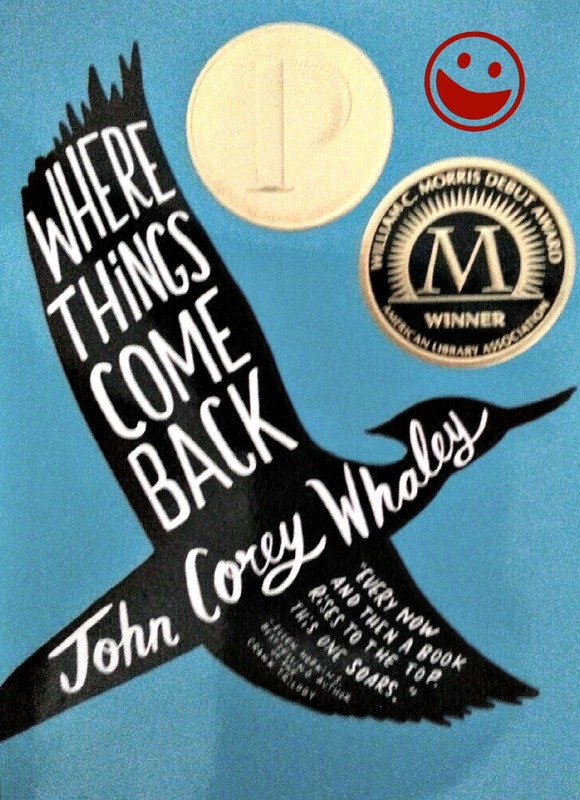 I look forward to reading more by John Corey Whaley in the future. I will end with a word of caution. I had seen this book back when it was in hard cover, and never bothered picking it up off the shelf to look at it further. I bought the soft cover copy from Barnes and Nobles about a month ago because the cover caught my eye along with the two awards on it. I let the original cover on the hard copy sway my opinion (which I admit I’m bad with judging books by their covers, but honestly who doesn’t do it every once in a while?!). I regret that I didn’t get to read this book sooner because of this fact. I’ve learned my lesson, but I am grateful the publisher chose a new cover for the soft cover release so I finally read this amazing book.